Admit it. You didn't think I'd have the nerve to wear the ugly cowboy print slouchy pants again. They're back along with my 80s sweatshirt estate sale find. 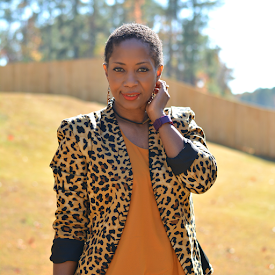 The Thrift That Look came from a Shopbop outfit that entered my Pinterest feed. The pants alone are $345. My thrift store creation is 5 bucks. 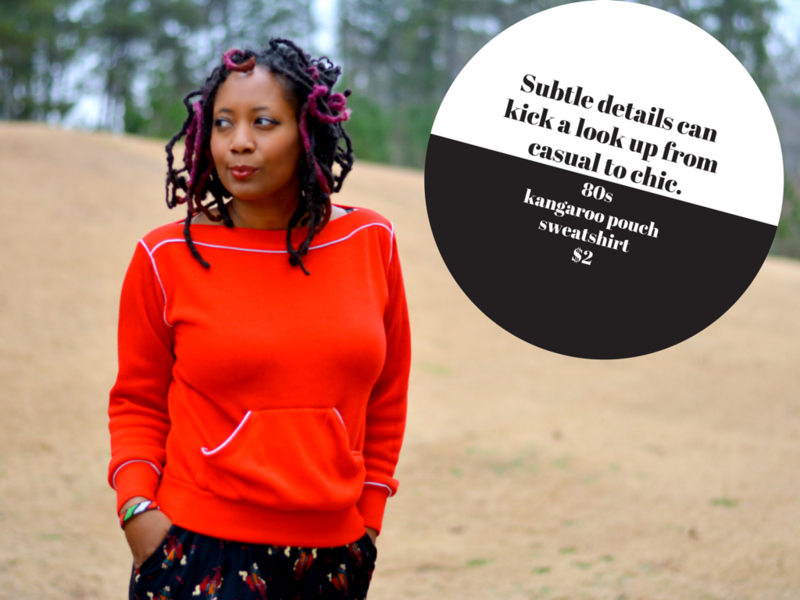 As I'm casually dressed most of the time, sweatshirts make a great throw on when you're rushing out the door top. A super soft broken in one from the thrift store feels so good on cold winter days. 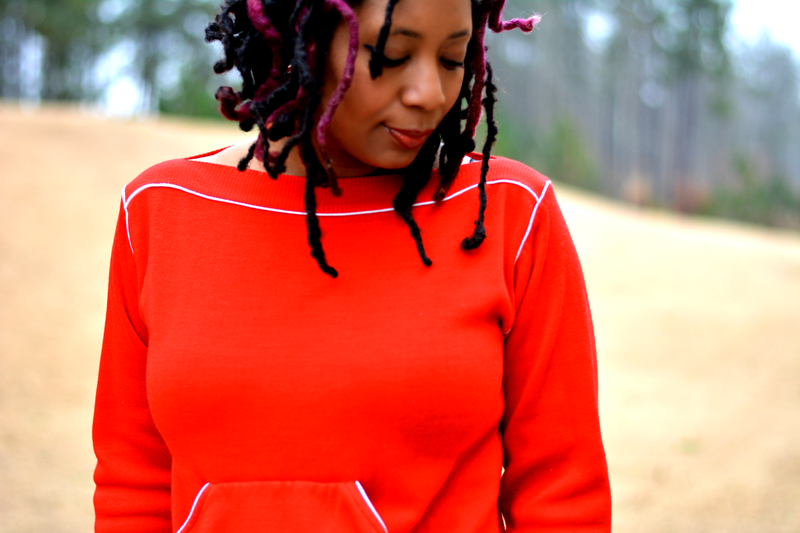 Good thrift store sweatshirts aren't so easy to come by. Sweatshirts in general are there in bulk. The ones you'd actually wear and have a good fit not so much. You'll need to dig for this one. You'd probably have better luck thrifting eBay or Etsy for one with subtle details to kick the outfit a notch. I found this one in an empty closet at an estate sale. Completely random and I wish I had several more just like it. 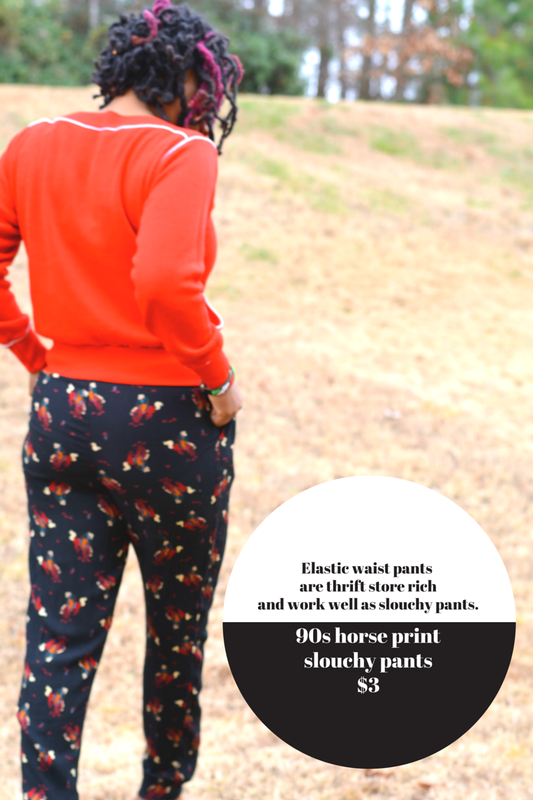 I have not professed my love for elastic waist in a while so allow me to completely gush over the horse print pants. We should not have given up on the envelope waist pants of the 90s. Maybe that's a stretch but these pants are so comfortable and easy to wear. The waistband cover my belly button and then some just like I like. Way more flattering on me than low rise. 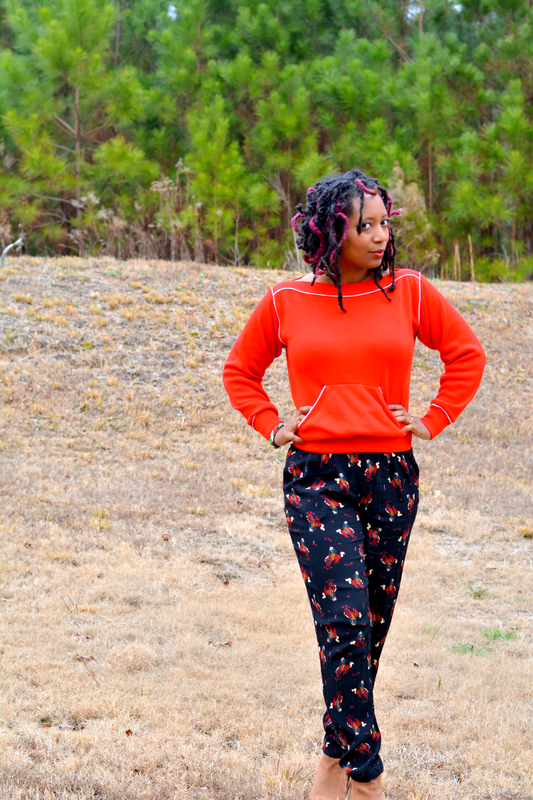 You won't find abundant slouchy pants per se at the thrift store. You will find elastic waist 80s pants. That's what you'll need to look at when looking for a pair with a nice drapey slouch to them. Wearing a sweatshirt and slouchy pants together is the perfect weekend bum around or on the town outfit. You're comfortable on the couch and you can glam it up with up a few accessories if you're venturing out for brunch! 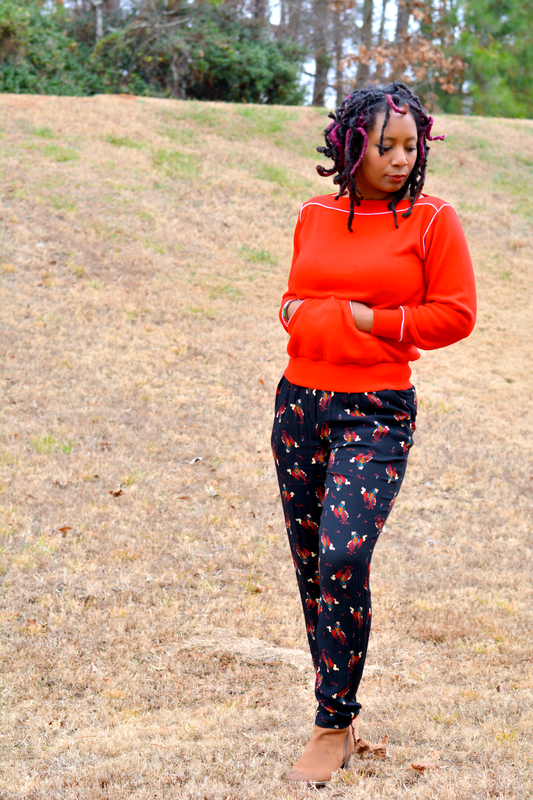 What do think about sweatshirts and slouchy pants? This is the second post in the Thrift That Look series. Check out the first one Tees + Sequins here. Love those pants! Great styling! That is so funny because I remember wearing those pocket sweat shirts in high school, glad so see them back...lol!